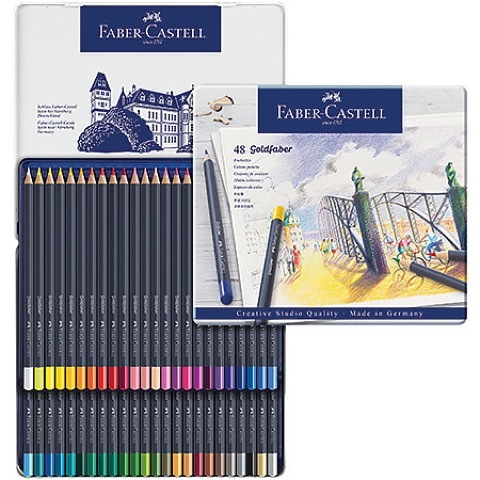 Goldfaber color pencils offer wonderfully soft and intense color laydown, outstanding color brilliance and excellent lightfastness. High-quality materials and SV bonding along the 3.3mm lead create an exceptionally break-resistant tip. They are water-resistant and smudge-proof. Each set includes an assortment of colors in a durable metal tin. The 12-Color Set contains white, cadmium yellow, dark cadmium orange, ultramarine, pale geranium lake, middle purple pink, light blue, emerald green, grass green, Van Dyck brown, burnt ochre and black. The 24-Color Set contains everything listed above plus light cadmium yellow, dark chrome yellow, permanent carmine, medium flesh, purple violet, cobalt blue, cobalt green, pthalo green, permanent green olive, Indian red, cold gray IV and warm gray IV. The 36-Color Set contains everything listed above plus light yellow glaze, scarlet red, dark flesh, magenta, blue violet, light ultramarine, helioblue-reddish, cobalt turquoise, May green, olive green yellowish, gold and silver. The 48-Color Set contains everything listed above plus dark cadmium yellow, light magenta, fuchsia, light flesh, crimson, bluish turquoise, light cobalt turquoise, deep cobalt green, light pthalo green, light yellow ochre, permanent green and burnt sienna.